...that I am taking a 12 week course in pharmacology for medical credits? Every year, in order to maintain my paramedic license, I have to get 20 continuing medical education credits; courses which are usually supplied by my employer. But due to our strike, which is in its sixth month and still unresolved, it is up to each individual employee to seek out courses and upgrade their credits. So, you see, my absence from this blog is justified! I have been hitting the books, and I know you probably don't want to hear about drugs and their interactions, receptor sites and pharmacodynamics, so I won't bore you with the details. Just wanted to let you know I have been busy! its good to be off the net anyways. taking a break is healthy. when you take a break from all the pharmacodynamics and pharmacokinetics, put something up. i'm waitng for your next saint quiz. Are you a Cafeteria Catholic? O Jesus, I place our nation under the protection of your Sacred Heart. Help us to do your Will so that we may be strengthened against the evil that threatens our country and our world. St. Michael the Archangel, protect our troops; keep them safe in their tour of duty. Immaculate Heart of Mary, I place all our people beneath the shelter of your mantle. Virgin Most Powerful, lead us in becoming a Godly nation. Amen. The Victory Rule provides helpful information for those wondering about commenting. A paramedic who loves her job, but first and foremost, a traditional Catholic who recognizes the tremendous grace and privilege of belonging to the Catholic faith. And yes, I use Canadian spelling. Humour, centre, colour and such. If you think it's spelled wrong, it's just the Canadian way! Glorious St. Joseph, model of all those who are devoted to labor, obtain for me the grace to work in a spirit of penance for the expiation of my many sins; to work conscientiously, putting the call of duty above my inclinations; to work with gratitude and joy, considering it an honor to employ and develop, by means of labor, the gifts received from God; to work with order, peace, moderation and patience, without ever recoiling before weariness or difficulties; to work, above all, with purity of intention, and with detachment from self, having always death before my eyes and the account which I must render of time lost, of talents wasted, of good omitted, of vain complacency in success, so fatal to the work of God. All for Jesus, all for Mary, all after your example, O Patriarch Joseph. Such shall be my watchword in life and in death. Amen. 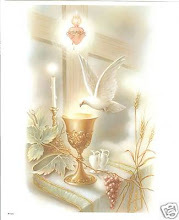 O gentlest Heart of Jesus, ever present in the Blessed Sacrament, ever consumed with burning love for the poor captive souls in Purgatory, have mercy on the soul of your departed servant Joe. Be not severe in your judgement, but let some drops of Your Precious Blood fall upon him, and send, O merciful Savior, Your angels to conduct him to a place of refreshment, light and peace. Amen. Sermon by St. Leonard - Amazing! 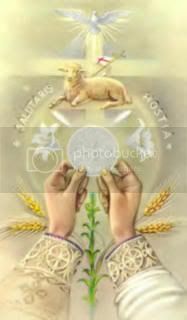 Do you kneel for Holy Communion? Do you pray the Rosary daily? I'm working on it - just not there yet!